"There is no racial bigotry here!" My army is officially completely painted. Sure I have to re-paint my Shocktroopers like I started to do months ago but they remain painted so my first sentence is not a lie. This afternoon I finished the last half of my Pikemen and also my Battle Mechanics. I painted them mostly with colours not appearing on any of my other units to make them look less like Khadoran army regulars and more like a hired civilian company. Not quite mercenaries; closer to if you called up AAA (CAA in Canada) and asked them to send a uniformed company of men to fix stuff and possibly crack skulls if the need arose. This entry was posted in Khador, Painting Table and tagged Khador, mechaniks, painting, WarMachine by Aaron. Bookmark the permalink. Those look fantastic, Aaron! I’m extremely impressed! 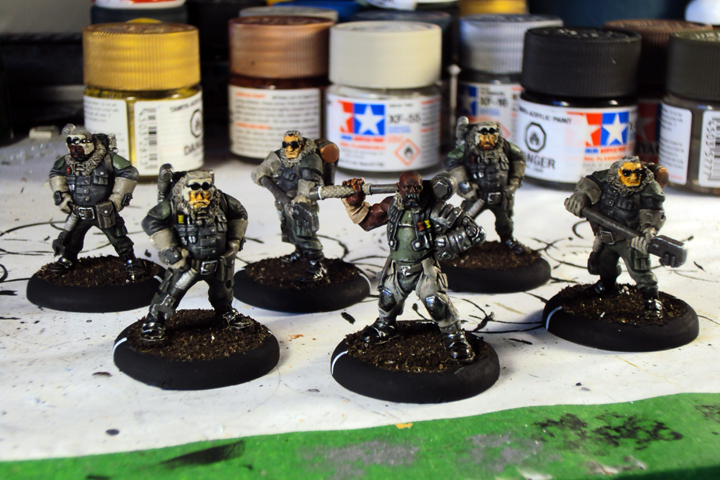 I too tend to try to broaden my skin-tone palette when it comes to painting troops… my Long Gunners use no less than 5 different skin colours in the 12 man unit, and my Menoth Wracks are each a different colour skin. Nice to see I’m not the only one that is conscious of this sort of thing!